Imagine…the grass is greening up and the flowers are emerging from the earth. Spring is finally here! These daffodils were defiantly the inspiration for this Springtime tablescape. Sunny yellow and citrus green make for a bright and cheerful table. I am participating in Tablescape Thursday’s at Between Naps On The Porch. 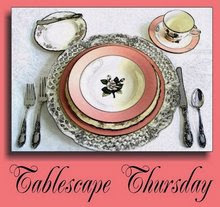 Be sure to stop by there to see other wonderful tablescapes. I will also be participating in Foodie Friday at Designs By Gollum. Please see all the wonderful foods here. You can never go wrong with white dishes. They go with everything. Here I have a mix of old and new. Lacy milk glass plates with milk glass serving cups on top. I used a fake star fruit on top of the cup…real would have been better. I borrowed this daffodil tea pot from my mother to continue with my table theme. Then recreated this centerpiece I made a few years back…it works so well with daffodils. I took this tall hurricane glass and placed a salad plate underneath. I had these glass green bubbles that I bought at Pottery Barn a few years ago, so I placed them on the plate with a small amount of water…just enough to cover the bottoms of the daffodil stems. Make sure to check the water level on the plate each day…as it evaporates quickly. Homemade placemats made of of yellow scrapbook paper and paper napkins. I found these pretty fan shaped napkins at Target last week…they are printed with blades of grass. I was just going to place them along the side of the plates only to discovered they were printed on all sides…look how wonderful they are unfolded. They frame the plate just beautifully. Plaid napkin rings in greens and yellow. Ceramic embossed salt and pepper shakers. Closeup of the milk glass. Napkins and glass bubble accents for centerpiece. 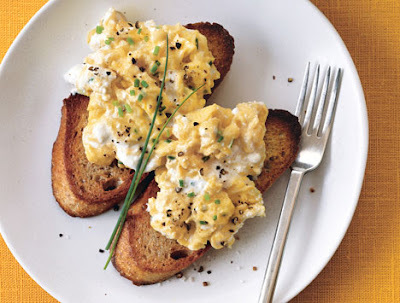 Soft Scrambled Eggs with Fresh Ricotta and Chives from Epicurious. Get the recipe here. 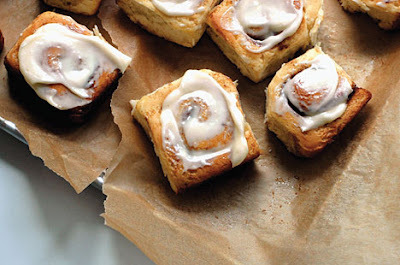 Cinnamon Rolls with Cream Cheese Glaze found at Epicurious. Get the recipe here. 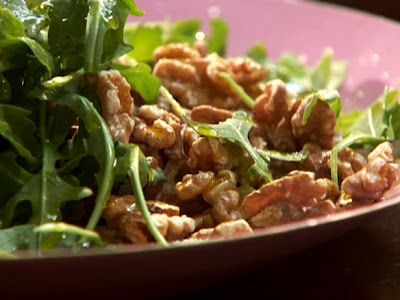 A yummy Arugula and Pear Salad by Rachael Ray. Get the recipe here. 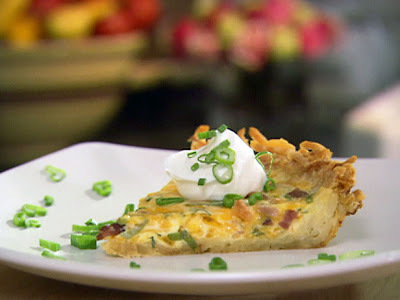 Hash Brown Quiche by Paula Dean. Get the recipe here.